About 2 months ago I bought some attractive Fingerling Potatoes from the Saratoga Farmer’s Market. I promptly forgot about their prescence in the house and they grew long, spindly eye buds and the potato bodies turned soft and flacid. Finally today I got around to picking the eyes off the potatoes to plant them. 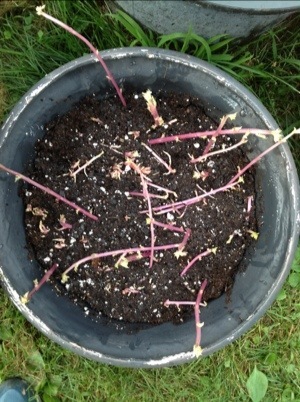 The eye buds are sprouts for new potato plants: people rarely realize or take advantage of this fact. In the cupboard far from sunlight the sprouts develop in a state of “etiolation,” which means the tissue lacks chlorophyl. 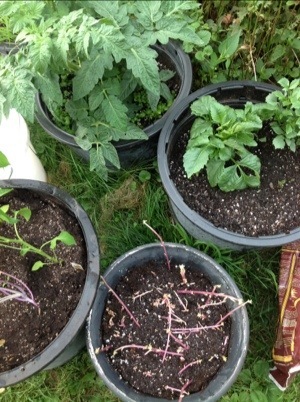 Immediately upon exposure to sunlight the sprouts will green up. Also, once the sprouts have been removed from the host potato it toughens up again and becomes palatable and useable once again. 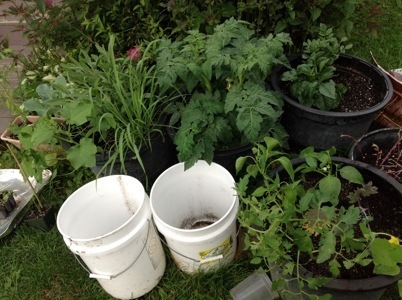 My potatoes are in our container gardens. We may need to move some of them around but this is a great starter spot for them to cultivate and green up. Container gardens can be full of the highest quality organic soils and this creates an ideal microclimate for generating strong baby plants.